Slowness has been on my mind lately. Probably because my life for the last three months has represented anything BUT slowness. Ever since we moved out of our old apartment and into a state of unknown (see here) there has been far less thriving and way more surviving than I would care to admit. I'm a busy body by nature. I can't sit still, but amidst the shuffle of the last few months I've lost so much of myself and my purpose and I need to get back to my normal. As a challenge to myself I want to make a little shift. I want to slow down. I want to embrace slow mornings where I have the chance to cook breakfast in my PJs and sip coffee as long as I want. 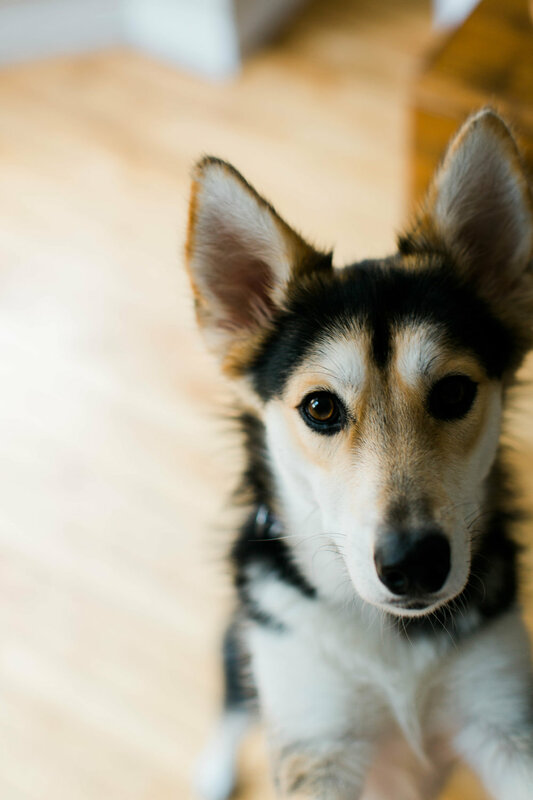 I want to forgo rushing from errand to errand or getting anxiety over the impending to-do list. Instead I want to slow down and take more breaths. Wish me luck. 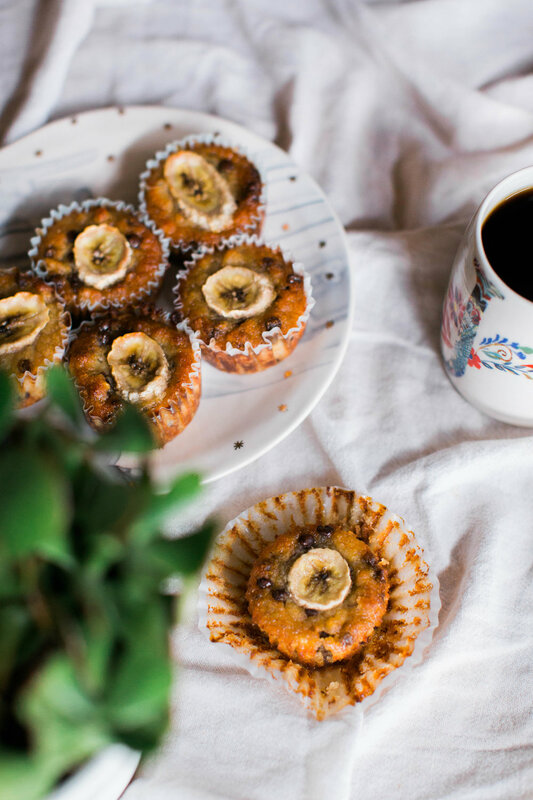 Between breaths you can find me making these paleo banana chocolate chip muffins. They're hella easy and damn good. And I know we're all about that. Preheat the oven to 350 and line a muffin pan with muffin tins. In a large bowl beat together the coconut oil, mashed bananas, maple syrup, eggs, and vanilla. In another bowl mix together the almond flour, baking soda, and salt. Slowly add the dry mixture to the wet until they are fully combined. Fold in the chocolate chips. Divide the batter evenly between the cupcake tins and then top each with a banana slice. Bake for 30 minutes or until a toothpick comes out clean. Take out of the oven and allow to cool. I hope your Fall is off to a great start! October has long been my favorite month of the year. It kicks off with my birthday on the 1st and then almost always beholds a mix of weather that gradually leads us from the excitement of summer and into the coziness of fall. Oversized sweaters, apple cider, and ALL the coffee make the looming doom of winter a little easier to ignore. This recipe is the very definition of cozy. I'd call it a warm hug for your stomach if I said stuff like that. But I don't say stuff like that so we'll just call it amazing and you'll just go make it and see what I mean. Things are pretty hectic for us during the fall so I like to keep breakfast quick and versatile so I can keep my morning routine moving. This recipe is best prepared on a Sunday afternoon (with a hot cup of coffee) and then stored in the refrigerator to eat off of during the weekdays. In the summer we tend to pour almond milk over the oatmeal squares and eat it cold out of the refrigerator, but on cooler days I take a second to heat it up and enjoy it that way. Preheat the oven to 350°F and spray an 8x4-inch baking dish with cooking spray. 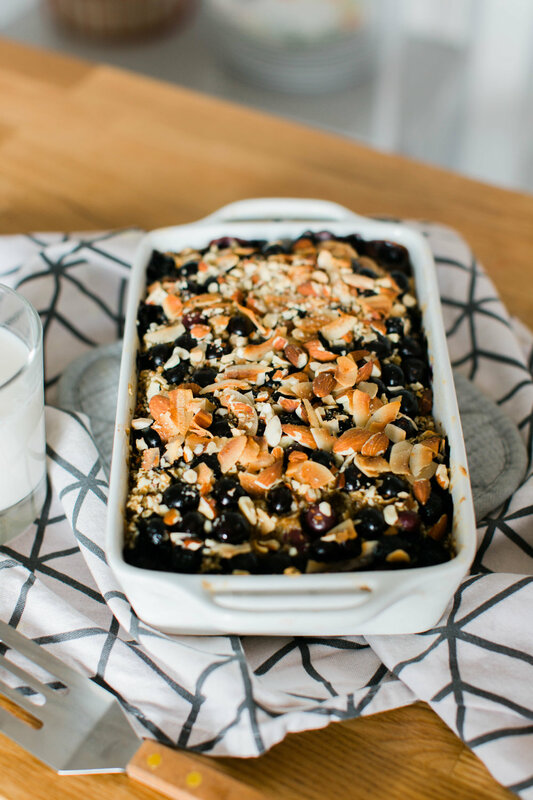 Place the coconut and almonds on a baking sheet and cook for 5 minutes or until golden. When done reserve 2 tablespoons of the almonds and coconut flakes and set aside. In a large bowl combine the oats, the remaining almonds, hemp seeds and coconut flakes, and the baking powder, cinnamon, and salt. In a medium bowl, combine the almond milk, egg, maple syrup and coconut oil and whisk to combine. Pour the wet ingredients into the bowl of dry ingredients and stir to combine. Layer the bananas and strawberries in the baking dish and spread the oat mixture on top. 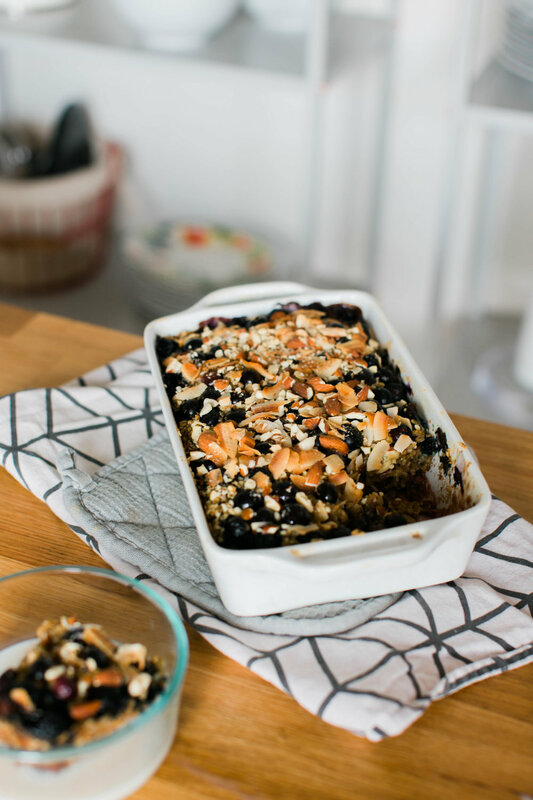 Sprinkle with the blueberries and the reserved toasted almonds and coconut flakes. Bake for 40-50 minutes or until the top is crisp and the middle is set. Remove and let cool for 15 minutes before serving. Health, along with simplicity, has been our thing this year. Or at least our attempted thing. And as of lately, we're actually making strides in both of those areas. Our pantry and fridge has been packed with less processed things and more nutrient dense foods. So many fruits and vegetables. Like, so many. We did make an ice cream run on Easter and the remains (for which I am actually very proud, because I so could have eaten the whole thing) sits in our freezer, but we are really making progress. On to the muffins! Typically muffins are tasty, but not something you can really eat every day. 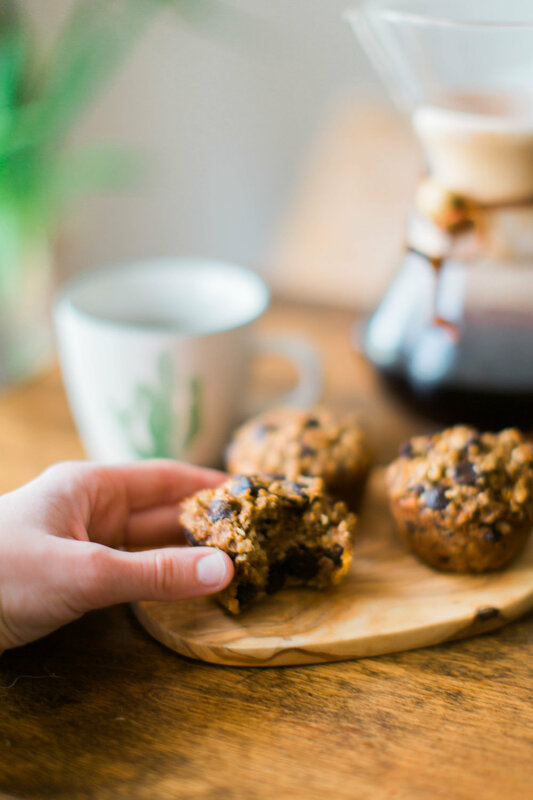 Well, let me introduce you to these yummy AND healthy muffins -- a rare find -- that you can totally eat every day. 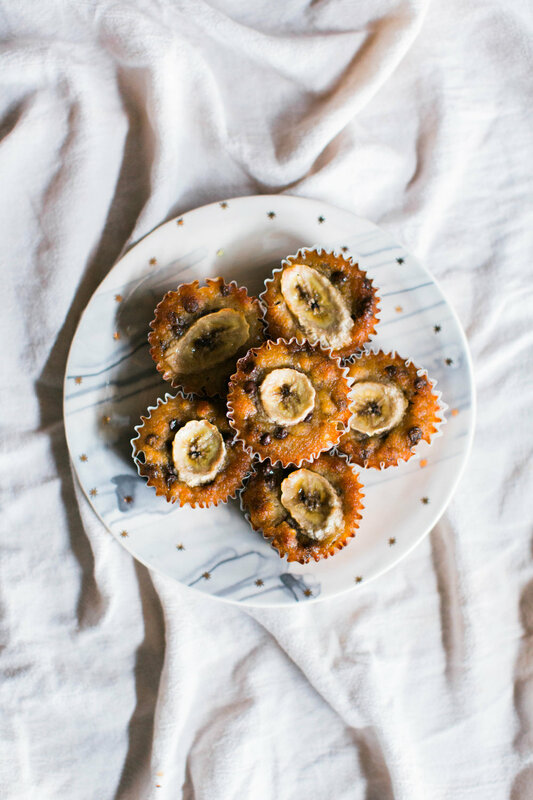 They're packed with whole grains and sweetened with bananas and a little bit of maple syrup. You could throw in some dried fruit, chia seeds, flax seeds, or any kind of nut to add some variety. So much versatility. We are totally in love. I like to grab one right before our morning workout or as a snack mid-afternoon. I keep them in the fridge to prolong the freshness. Because we don't have a microwave and heating them would take too long I tend to just eat them straight out the the fridge, but they're super tasty warmed up as well. I hope that these become staples in your house and that you love them as much as we do. If you come up with any awesome variations, let me know! I am always looking for ways to make things fresh and new. Preheat oven to 325 degrees. In a large bowl or food processor, combine the oats, salt, cinnamon, baking soda, and baking powder. Add in the bananas, maple syrup, vanilla, and milk. Combine the eggs in gently. Portion the batter out into 12 muffin tins. 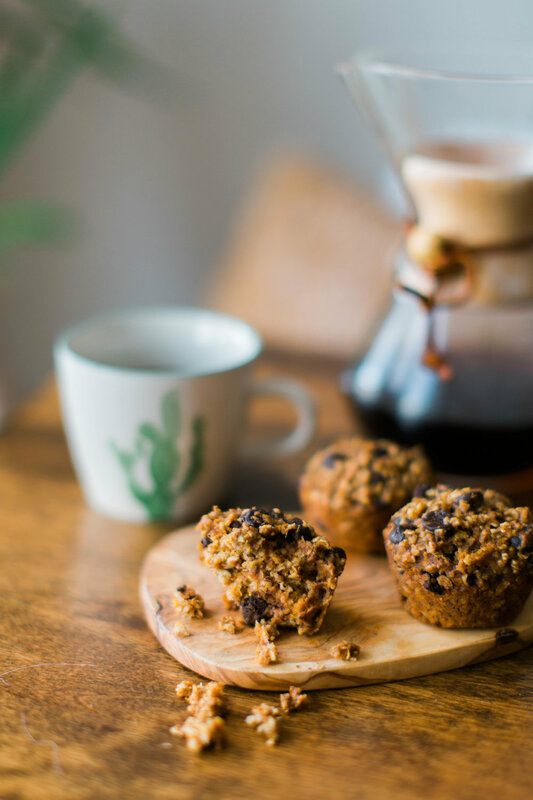 Top with the reserved oats and bake for 15 minutes or until a toothpick comes out clean when inserted in the middle of the muffins. When the toothpick comes out clean, remove from the oven and allow to cool. Enjoy!